The Super Bowl is getting traded. No, really. NBC and CBS have agreed to a deal that will give CBS the broadcast rights for the game in 2021 and NBC the broadcast rights for the game in 2022. Why have the networks agreed to make that move? It all has to do with the Olympics. NBC is set to broadcast the 2022 Olympics, and wants to host both events so it’s easier to sell advertising. CBS isn’t just doing NBC a favor here. The deal also benefits CBS. The network won’t have to air the Super Bowl against the Winter Olympics anymore. By swapping to 2021, it can air the big game as usual and expect roughly the same amount of people to tune in. 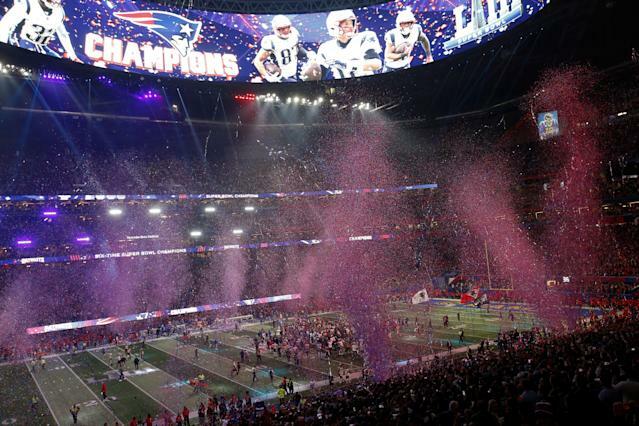 Under the current system, broadcast rights for the Super Bowl alternate between Fox, NBC and CBS. Fox will host in 2020, CBS will take 2021 and NBC will now have 2022. Fox will get the game again in 2023, but then that deal expires, meaning other networks — like ABC/ESPN — can make a play to broadcast the game. The last time ABC had Super Bowl broadcast rights was 2006. Ultimately, the trade won’t impact fans at all. Based on the popularity of all those “When is the Super Bowl” posts, fans generally wait until days before the Super Bowl to find out what network is carrying the game. Most fans will never even know the 2021 and 2022 Super Bowls were traded. If you’re reading this, you do. Use this knowledge to impress your friends in a few years, or to win a crucial round of bar trivia a couple years down the road.